A non-government organization (NGO) specializing on labor migration has issued a warning recruitment agencies and medical clinics catering to Overseas Filipino Workers (OFWs) to be wary of a scheme allegedly hatched by the Gulf Cooperation Council (GCC) Ministry of Health, which collects $10 for online registration fee for each one of Middle East-bound OFW applicant. “This online registration scheme appears to be a multi-million peso scam targeting our OFWs,” said Susan Ople, head of Blas F. Ople Policy Center, in a statement. Ople said the online medical registration scheme would earn the GCC Ministry of Health at least P222 million per year. The Philippines deployed 333,671 newly hired workers to GCC member-countries in 2015 based on Philippine Overseas Employment Administration (POEA) data. 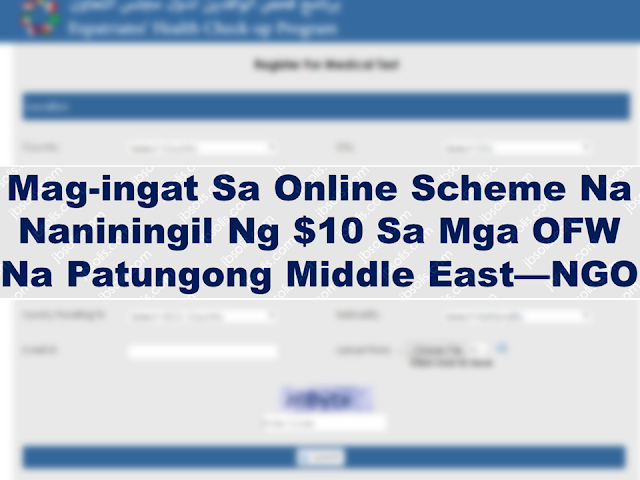 The Ople Center said OFWs bound for the Middle East were now being required to pay an extra $10 in registration fee online for a pre-employment medical examination. The new requirement was allegedly imposed by the GCC Ministry of Health. The DOH circular, signed by Health Undersecretary Rolando Enrique Domingo, also advised the public and DOH-accredited clinics for OFWs to report any activity related to the online registration scheme. Ople said the POEA had yet to recognize the scheme. She also urged the Department of Foreign Affairs to check whether Gulf countries that host Filipino workers had authorized the GCC Ministry of Health to collect the fees on their behalf.